Paper Crafts by Candace: 1000 Follower Giveaway!! Thank you Candace for all the giveaways! Thank you for the opportunity Candace!! Congrats!! I would LOVE this cart so much...crossing my fingers!! What a great giveaway, This is on my wish list. LOL As are so many. Another giveaway! Sweet! You are too sweet! Of course you have so many fans your work is awesome! I really appreciate all the help you have given me! How exciting! I would LOVE this cart. I have not been able to buy new carts in a while and there are so many I want! Candace congrats on your 1000++++ followers . Your giveaways are out of this world. Thanks for the chance to win. Congrats on your followers, thanks for the chance to win! CONGRATS!! on all the milestones. I love all your projects. They are all so cute and fun..
Congratulations on hitting the 1000 mark! Now on to the next 1000. Congrats on the followers!! I have been wanting this one for awhile!! Thanks for the chance to win! What a wonderful milestone! Congratulations, you deserve it! Thank you so much for this giveaway and congrats on 1K!! 1000 congratulations to you! You make great projects and are very encouraging to your followers. Congratulations again, you deserve every moment of this success! Congratulations on all of your followers, I bet you'll have another 1000 in no time. I love all of the fun projects you do, especially the banners you make. Thanks for inspiring us! Perfect Cartridge to giveaway!!!!! It's on my wish list..
Congrats on hitting 1000 cool. Congrats on the 1000! You are so talented I am lucky to be one of your followers! Thanks for the chance to win! Love this giveaway. Congratulations on the 1000 followers. Congrats on a 1000, thanks for the chance to win. That is awesome!! Congrats Candace on reaching 1000. I luv following your posts with your creations. This is a cute cartridge!! How great to have all these crafters together with great ideas! The giveaways are an added bonus! Congratulations!!! 1000 followers! Congrats!!! What a huge milestone! I have dreamed of owning this cartridge. I even at one point thought I had it cause I looked at it so many times. What a fabulous giveaway. I will keep my fingers crossed. Love your blog! Thanks!! What an exciting time to reach 1000 followers! I hope you are getting there quickly! A great giveaway. Thank you for the opportunity! 1000 soo cool.. I love your blog.. I hope I win..
Congrats on the milestone. I have been a follower for a little while now. What an adorable cartridge. Thanks for the chance to win it! Congratulations on 1000 followers. That's awesome. Thanks for the chance to win this cartridge. I don't have this one. Wow! Congrats on 1000! That is alot!! Congratulations on 1000 followers! Thank you for this incredible giveaway and for sharing your amazing creations with us!! Love your work and all the giveaways. I hope to get this cute cart!!! New follower! Love your work. This is a great giveaway! Thanks for the chance to win it! Congrats Candace!!! Thanks so much for sharing all your creations with us! They are so fun and creative. :0) Your blog is the first one I have ever followed! Thanks for the chance to win! Thank you for the opportunity to win a great bit of candy. Congrats on moving over the 1000 followers mark. I love following your blog. Keep up the inspiration. you are always giving away such nice things! Congrats on the 1000, soon it will be double that! This cart. rocks. I would sure like to have it. I'm checking back to see if I win. ps. thanks for the chance and congrats on 1000+ followers. Thanks for the chance to win! Love your blog. Congrats on reaching 1000 followers! That is wonderful! Thanks for the chance to win an awesome prize! SUPER giveaway! Ths for sharing all you do! congrats on reaching 1000 followers! Thanks for a chance to win an awesome prize! Woo Hoo! Congrats on 1000!! Hi, Candace! What an awesome thing to do for your followers! You're the one who rocks! Thanks for the chance to win this cool cartridge. Cograts on your followers!! Love your blog and all of your projects are amazing!! Thanks for the chance to win such an awesome cartridge. I love all the great ideas I get from your blog!!! Hope I win!! Congrats & thanks for the giveaway! Congrats on reaching such a grand number of followers! Would love to win the cartridge...just like everyone else! Fingers crossed. wow, 1000! that is totally awesome! Congratulations! (already a follower)Congrats on 1000 - wow must be exciting ... - Thanks for a chance to win, I would love to win this cart. WOW - 1,000 is a milestone and quite the accomplishment. It just goes to show that you have a FABULOUS blog and wonderful talent that keeps us coming back to see what you are creating. Thanks for sharing with us! CANDACE CONGRATS ON 1OOO i WOULD LOVE TO ADD THIS cartridge to my small colllection as I'm new to this and don't have very many cartridges yet. Congrats on hitting a 1000! Cool cart, i would love to have it! Super awesome giveaway! Thanks for the chance to win! Contracts on reaching 1000+ followers. I don't have this cart. Thanks for the chance for winning. congrats on 1000+ followers!! Thanks so much for the chance to win. Congratulations on your success. You are truly an inspiration to me. I am hoping to start a blog soon...though not sure I'll be as popular as you. Thanks for all your creativity! Congrats on 1000 followers!!! Awesome giveaway. Thanks for the chance to win. Congratulations on the blog success!! Thanks for the opportunity to win! Congrats on 1000! :) What an awesome giveaway - thanks so much! Congrats on 1000! How exciting! What a great giveaway also! Congratulations Candace on all of your followers. If you ask me, we are the lucky ones. I am proud to say that I just became a follower to my first blog. Also, THANK YOU for all of the help you have given me recently. It is appreciated more than words. Congratulations on 1000 Followers! That is huge!!! Congrats on 1,000 followers! Thanks for the chance to win! Congrats!!! Thanks for the giveaway. You do awesome work and I love to see all your ideas! Congrats!!!!! I would love, love, love to win that cart! Thanks for a chance! I love this cartridge! Thanks for the chance to win, now just make it happen, hahahah. Very cute blog! This looks like an awesome cartridge. Thanks for a chance at winning it. congrats on reaching 1000. thanks for the giveaway. Congrats on your 1,000 Followers!! Reaching 1,000 followers is quite an accomplishment. Congratulations! Congrats on having 1000 followers! !Great prize too!! Congrats on 1000 followers! I love your blog, so many great ideas! Thanks 4 this cool giveaway. Would b nice 2 add to my small collection of cartridges. Congrats on your 1000 followers!!! congratulations on 1000 followers. I follow you. Thanks for the chance to win! Wonderful giveaway..congrats on 1000 followers! Congrats on 1000!!! It shows how very talented you are! WOW Wtg 1000! Thanks for the giveaways! I would treasure this cart if I owned it! Thanks for the chance! You have 1000 followers because you are THE BOMB! I started following you a few weeks ago and when I log in, I check your blog out FIRST! Thanks for the great ideas and the AWESOME giveaways! Congrats on 1000!! Just found your blog by surfing today and love what I see. Would love to play with this cartridge some day - it would be perfect for my upcoming grandbaby in September!!! congrats candace!!!!! I Love that cart!!!!! Wow, that is fantastic!!! I would love to win this cartridge. WOW!!!! Congrats on 1,000 followers! Here's to 1,000 more!! Thanks for sharing and thanks for the chance to win! Wow that's awesome. Congrat on your 1000 + follower and many more. Thanks for a chance to win this awesome cartridge look like this is a fun cartridge to have. Congrats!! Now for the next 1,000! Congratulations of your 1000! I would love to win this cartridge! Congrats Candace! I have been a follower for a long time, love your blog, and here to many more! Awesome!! Congrats on hitting 1000! Thanks for the chance to win an awesome prize. Co0ngrats on reaching 1000! I am a relatively ne w blogger so I can't even imagine having that many followers; maybe one day! Thank you for the awesome giveaway! Congrats! I hope I win! Clicking around and look what I've found! Congrats on the 1000 follers! Your amzing! I have to say that I have been a huge fan of yours. I follow your blog and your facebook and just love all that you come up with. You've inspired more than one of my many projects.... that's for sure!!! Congrats on 1,000 followers... definitely well deserved! I'd love your blog and designs! Thanks for a chance to win. Oh, and congratulations on 1000 followers! Congratulations for your 1000 followers. 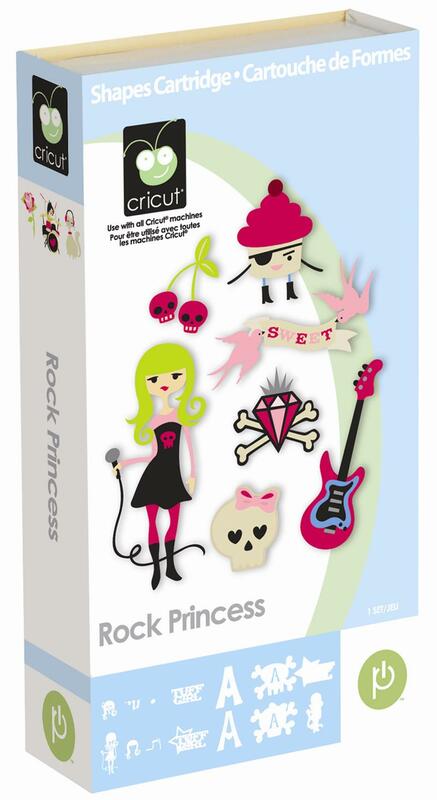 I would love to win the Rock Princess cartridge. Thanks for the chance to win. Congrats! Here is to another 1000! Just came across your blog and recently started following :) I would love to win this!! It's one that's on my wish list. Love the card for Michelle. So need to know where you got the stamp from. Great job with the card. Your coloring looks great.